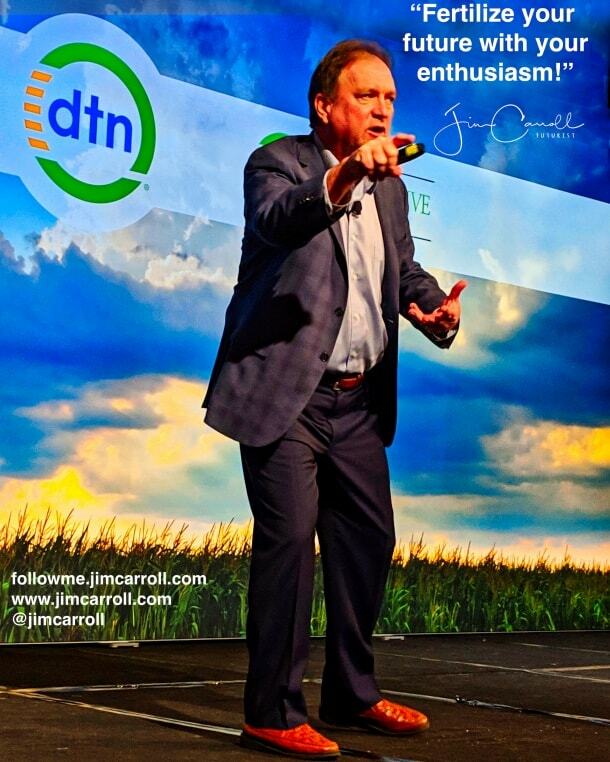 From the stage yesterday in Chicago, where I spent my time with a few hundred farmers and other folks in the agricultural sector, at the DTN Ag Summit. I love the world of agriculture, because unlike many other industries, it has a large number of participants who are relentlessly focused on new ideas, concepts and innovation. They’re flying drones, doing geospatial analysis of crops, using Fitbits for cows, exploring robotics and autonomous vehicles, expand their energy output through innovative biofuel concepts and more. Not all of them, of course. There are still some in the community who are apathetic, close minded, stuck in the 1970’s. Not the folks in the room yesterday, though. They are part of the aggressively innovative farming community, and it’s a breath of fresh air to be able to share my insight on what comes next with them. People would do well to learn about innovation from this group of farmers; they are open to new ideas, collaborative for advice, willing to take innovative risks, are adept with all kinds of different concepts, regularly explore new technologies, and are passionate for their purpose. A shoutout to Will Scholze, a farmer from Humbird, Wisconsin, who was hanging out in the first row and got drafted for photo service!